We are a small cattery outside of Louisville Kentucky located in Southern Indiana. 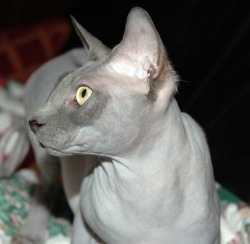 The name J-Sphynx came from my son Jared. All our breeders are named " J " names. 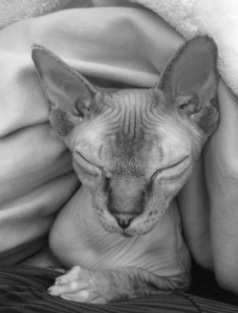 The love of sphynx came from adopting our first retired breeder "Peabody". She brought us so much joy. I had never had a cat before due to a medical condition. My husband had always had cats and wanted them. My daughter was working for a vet and had seen Peabody several times. She told me everytime she walked by, Peabody would reach for her. We then found out she would be up for adoption. This was the answer, he could have his cats and I could still breath. When I saw her I was facinated by her nature. Since then I have fallen in love with the breed. I have done my research and decided I only wanted the best. I wanted to be able to show them and love them as part of my family. When choosing my new family members I wanted them to be very well bred and have colors you dont see alot. The kittens I chose had to be TICA/CFA registered. We are a "Herpes free cattery". We carefully health screen for FELV/FIP. All breeders are HCM scanned. When buying a sphynx please ask questions concerning health. Our kittens have a complete blood panel before leaving. This is our special girl. She made us fall in love with her. She was the head of the household. Thats why we call her Mrs."P". We are sad to say we lost Peabody January 08,2012. She will forever be missed. or (502)376-1665. I will only sell a kitten if I speak with you and know you have researched the breed. These babies are family to us. With a deposit, we allow you to make payments up to the day you pick up your new family member.